Two victims. One sociopath. Lots of terror. Lu will watch as he kills Lisa and be offered a choice – become his slave or share the fate of her friend. Then Rad will get so deep inside her that she will no longer know where he ends and the pathetic remnants of herself begin. But Lu has a little surprise for Rad . . . I'm not sure why I was under the impression that this was a YA (Young Adult) novel. Boy was I wrong. This is a truly gruesome and graphic tale! There are a lot more than two victims in this book, but the main story does focus on these two victims. There is an element of the paranormal, but I found myself wondering if it was truly paranormal or just the coping mechanism of an abuse victim. I'm still undecided on that one. Mary Maddox has written a twisted and grisly story that will pull you in and keep you wrapped around her finger until she's ready to let you go. It may be a little bit dark for some, but it left me thinking long after I finished reading it, which for me is the sign of a really good book. Do you like your thrillers dark? I began my life in Soldier Summit, Utah, a town of a few dozen people high in the mountains. My father owned a cafe, a gas station, and a combination grocery-bar – literally half the businesses in town. Even a minnow can be a big fish if the pond is small enough. Though I have lived in the Midwest for most of my adult life, I still miss the mountains and dream that someday I’ll live there again. When I began college, I left the mountains for the Midwest. I graduated from Knox College and the Iowa Writers Workshop at the University of Iowa. At present I teach composition at Eastern Illinois University in Charleston, where I live with my husband, Joe, and our bird, Westie. 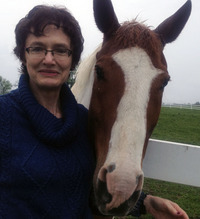 Along with writing fiction, I spend my time reading, playing Scrabble at the local club, and riding my horse, Tucker. 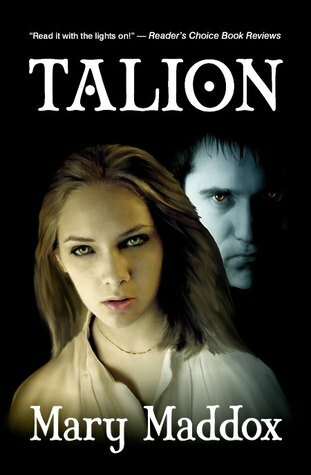 I am the author of the paranormal thriller Talion and the owner of Cantraip Press Ltd.
You can catch up with Mary on Twitter under the handle Dreambeast7. You can also learn more on her website. Thank you for taking the time to read and review Talion. I'm glad to have discovered your blog.